Home Tags Posts tagged with "sleeping beauty"
Nicole Delien, a Pennsylvania teenager, slept for 64 days from Thanksgiving into January – her longest sleeping episode yet – as she struggles with a rare sleep disorder called Kleine-Levine, or Sleeping Beauty Syndrome, which affects an estimated 1,000 people around the world. During her sleep spells, which began when she was six and a half, Nicole Delien, now 17,will wake up in a confused state for small periods of time to eat, drink and use the bathroom and then fall back to sleep. 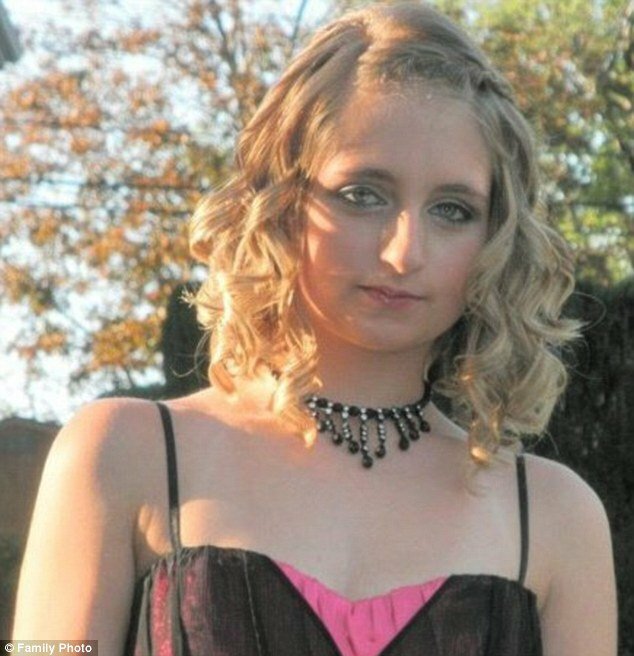 “I don’t remember what happens [during that time],” Nicole Delien told the Today Show on Tuesday. Nicole Delien’s mother, Vicki, says her daughter will sleep 18 to 19 hours a day, and when she eventually wakes up to eat she is in a “sleepwalking state which she doesn’t remember”, KDKA in Pittsburgh reported last week. The Delien family also recently appeared on Jeff Probst’s syndicated talk show to make sure other families become aware of the rare disorder. Vicki Delien told reporters that it was very frustrating trying to get a diagnosis for her daughter. She said it took several hospital trips to figure out what has been afflicting her. Eventually, Dr. Michael Rancurello, a psychiatrist at Allegheny General Hospital in Pittsburgh, Pennsylvania, was able to pinpoint the disorder and offer some suggestions on how to manage it, including medication. “It’s really not sleeping,” he told the Today Show, calling Nicole Delien’s unconscious state a “delirium”. “I think it’s a manifestation of some brain malfunction,” he said. Individuals affected with the disorder may go for a period of “weeks, months or even years without experiencing any symptoms, and then they reappear with little warning” the Kleine-Levin Syndrome Foundation website states. In addition to excessive sleeping, those symptoms include disorientation, hallucination, child-like behavior, binge-eating and periods of hyper-sexuality when awake, according to an Oxford Journals report. That report says the disorder predominately affects young males. Symptoms may be related to malfunctions in the parts of the brain that govern appetite, sleep and sexuality, according to the National Institute of Neurological Disorders and Stroke. The cause of Kleine-Levin Syndrome is unknown, both medical sources indicate. Eric Haller, a young college student with the disorder, told ABC News in February that he gets sick and falls into a sleeping episode about eight to 10 times a year. He still shows an aptitude for working and learning. The 21-year-old from Placentia, California, maintains a 3.5 average at Fullerton State University and interns for the Los Angeles Clippers. However, his abilities decline when he slips into a trance. Kleine-Levin Syndrome can last for eight to fourteen years of an afflicted person’s life, Dr. Michael Rancurello said, noting that Nicole Delien is reaching the mean length of symptoms right now. Medication helps spread her episodes further apart, her family says. Still, Nicole Delien says she has missed out on Thanksgiving, Christmas and other family celebrations due to those spells. She also missed out on an opportunity to meet pop singer Katy Perry. But when Perry later learned about Nicole Delien’s disorder she made sure Nicole was able to visit her backstage at a performance in Connecticut. As she grows older, Nicole Delien says she hopes to have “more good memories like that one”. Nicole Delien’s last sleeping episode was in March. She said that she’s scared of when it will happen again. 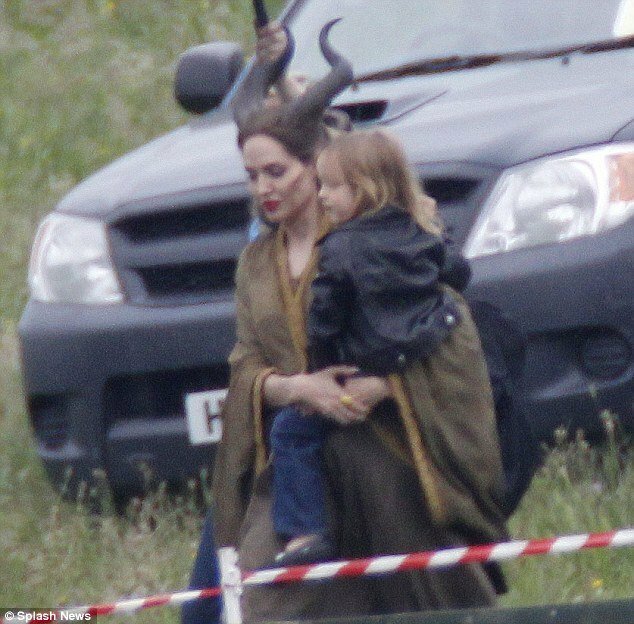 Angelina Jolie is certainly in need of regular touch-ups for her latest role and was spotted being pampered on the set of Maleficent in Buckinghamshire today. Angelina Jolie, 37, has taken on the role of evil sorcess Maleficient in an adaptation of Sleeping Beauty and to do so, she has undergone something of a transformation. 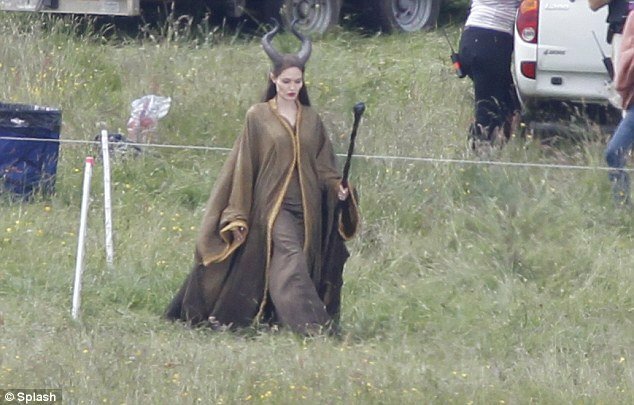 The actress was seen in the middle of a field today in full costume as she continued to film scenes for the upcoming Disney movie. Wearing a long brown cape and black horns, Angelina Jolie was spied having her make-up retouched by a female artist while a male member of the crew dealt with her long brunette hair. It was only yesterday that fans got a sneak peek of Angelina Jolie’s character and what they can expect from the fairytale film. Wearing a leather horned headdress, and yellowed contacts, Angelina Jolie was also given a bit of help in the cheek department with the addition of some Lady Gaga-style cheek prosthetics. In this updated version, the focus of the film centres on the events that hardened Maleficent’s heart, leading her to curse the baby Aurora (Sleeping Beauty), played by Elle Fanning. Angelina Jolie told EW: “It’s not anti-princess, but it’s the first time they’re looking at this epic woman. As a woman who is used to dividing opinion, Angelina Jolie was clearly attracted to taking on such an “imperfect” character. Angelina Jolie was seen taking her family to see musical Wicked based on the novel by Gregory Maguire while in London, which similarly tells the story of the Wicked Witch Of The West before she turns bad. According to the popular fairytale, Maleficent was angry that she wasn’t invited to the beautiful Princess’s christening, and as a result cursed the infant to prick her finger on the spindle of a spinning wheel and die before the end of her 16th birthday. Other stars signed up to the film include Miranda Richardson, who will play Queen Ulla, and Juno Temple, as Thistletwit, one of the three fairies tasked with taking care of Aurora in a cottage in the woods – which, going on the set, may now be a tent in a small settlement. But it is still unclear who will play Prince Philip, Aurora’s love and the man who defeats Maleficent, although as other characters’ names have been changed, it could well be Control star Sam Riley, who is billed to play Diaval. Angelina Jolie and Brad Pitt have made the U.K. their temporary home and have been seen on family outings to the theatre and stores. Crew member have been busy erecting tepee style tents, stoves over open fires, crumbly brick walls and horse-drawn carts.